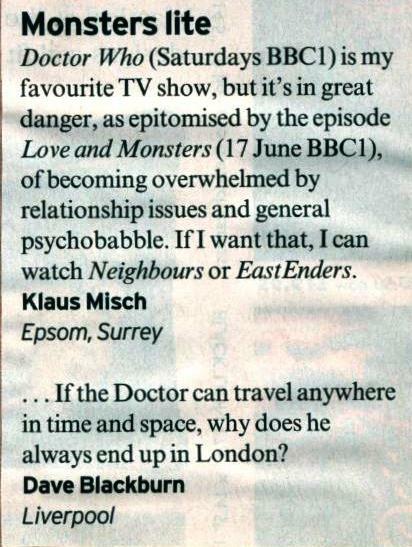 Doctor Who (Saturdays BBC1) is my favourite TV show, but it's in great danger, as epitomised by the episode Love and Monsters (17 June BBC1), of becoming overwhelmed by relationship issues and general psychobabble. If I want that, I can watch Neighbours or EastEnders. ... If the Doctor can travel anywhere in time and space, why does he always end up in London? APA 6th ed. : (2006-07-01). Monsters lite. Radio Times p. 144. MLA 7th ed. : "Monsters lite." Radio Times [add city] 2006-07-01, 144. Print. Turabian: "Monsters lite." Radio Times, 2006-07-01, section, 144 edition. This page was last modified on 10 February 2016, at 23:54.